everal years ago, I found this recipe in a magazine. It looked simple and very delicious. We still had a teenager at home so I was always on a quest to discover meals that were inexpensive, nutritious, and tasty. Needless to say, it turned out to be a great success with my entire family. A short time after I experimented on my own family, my parents came through our town on their way to their farm in Montana. My Dad had retired ten years prior to their visit and they were still in the process of shuttling cars and possessions, back and forth between their winter home in Miami and the farm in Montana. I made this dish for them, along with vegetables and a salad. They enjoyed it very much and my Mom asked for the recipe. She is a fabulous cook, so I knew that this dish made quite an impression. For the past fifteen years this recipe has been popular with family and friends. Hopefully, you will enjoy it, also. Wash and pat dry the chicken breasts with paper towels. Place a few spoonfuls of the sauce on the bottom of a 3 quart rectangular baking dish. Arrange the chicken breasts in a single layer. Pour the rest of the sauce over the top of the chicken. Bake, uncovered, in a 350 degree oven about 30 minutes or until the chicken is tender and no longer pink. 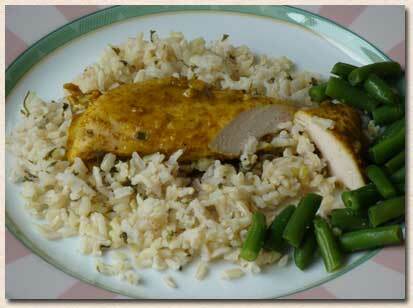 Serve the chicken and pan drippings with hot cooked rice.